This Anti-Static Record Brush is essential equipment. It has over one million tiny carbon fibers which go deep into the record groove and remove stubborn dust particles. Its body has a copper wire grounding system to eliminate static buildup. For best results, ground your body to the stereo system by holding one hand on the turntable deckplate while sweeping the record. 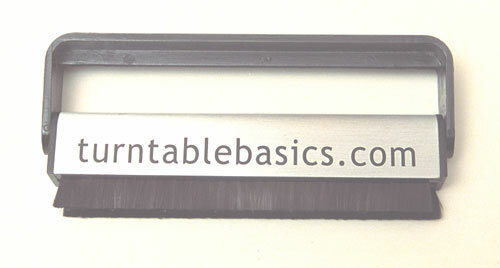 The brush's body has a rib in the frame for cleaning off the bristle ends. Contains one micro-bristled brush; one cotton chamois cleaning cloth; one 2-ounce bottle of record cleaning fluid; cotton storage bag. 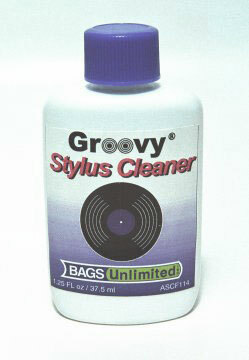 Record Cleaning Fluid Refill 4 oz. 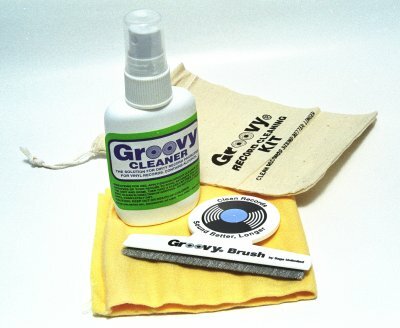 Groovy Cleaner is specially formulated for its deep-cleaning, anti-static, residue-free properties. Contains alcohol. 4 ounces cleans about 50 records. Comes in a convenient spray-top bottle. Contains one micro-bristled brush; one cotton chamois cleaning cloth; one 2-ounce bottle of record cleaning fluid; cotton storage bag. Fluid is alcohol free for safe use on shellaced and acatate records. Specially Formulated for 78 RPM Shellac, Laminate and Acetate Records. Contains no alcohol. 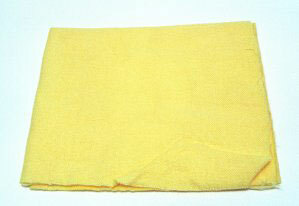 Easy to use Cotton Chamois Record Cloth contains a unique anti-static solution. 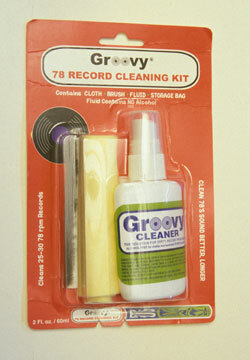 Lubricates and protects the record as it cleans. Precision Stylus Cleaning Brush with dense nylon bristles. 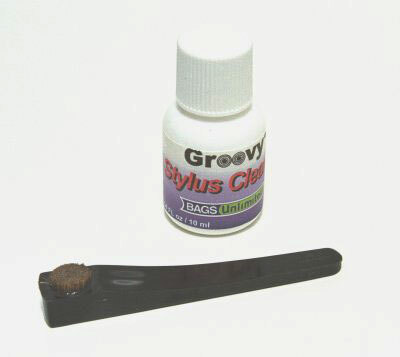 Cleans buildup from the stylus. Includes 0.34 oz. of cleaning fluid.